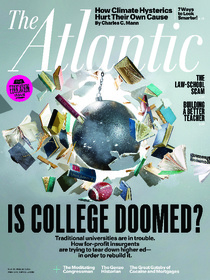 The cover is provocative, as is the headline title: “Is College Doomed?” In this issue of the Atlantic, Graeme Wood examines whether traditional college will be usurped by online options which will cut the costs of an education, make it accessible to more people, and strip it down “to its essence: no lectures, no football games, no ivy” (article now online at The Atlantic site). Paul Campos also addresses the “Law-School Scam,” while Sara Mosle discusses Elizabeth Green’s new book: Building Better Teachers. Less compelling is the feature on “7 Ways to Look Smarter.” Wearing glasses, whether or not you need them? Using middle initials? Come on, now. 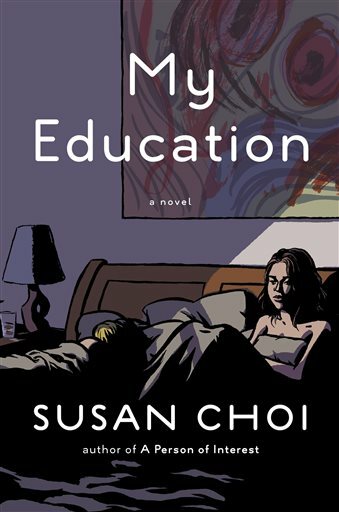 I have been pressing Susan Choi’s latest book, My Education, on many friends, ever since it came out last year. When I spotted a copy in the Brookline Booksmith and leafed through the first few pages, I couldn’t wait until I had made a dent in my sizable pile of unread books waiting at home; I bought my copy in hardcover, took it home, and prayed it wouldn’t interfere with my grad school workload. Spoiler alert: it did. Now it’s out in paperback, and you have no excuse to not partake in Choi’s delicious and intricate prose, style, and plot. This has to be one of the most sensory, sensuous, and sensual books I’ve read in years. My Education is narrated by Regina Gottlieb, a graduate student with a penchant for making huge mistakes that affect the lives of everyone around her. At first glance, you think the novel will be about the misadventures that take place as she fools around with the mysterious and stereotypically brilliant, desirable, and young professor Nicholas Brodeur. But that’s only until you witness Regina’s encounter with Brodeur’s equally brilliant wife, Martha. This entry was posted in Culture Updates, Literature and tagged Bag Raiders, college, education, My Education, Susan Choi, The Atlantic. Bookmark the permalink.